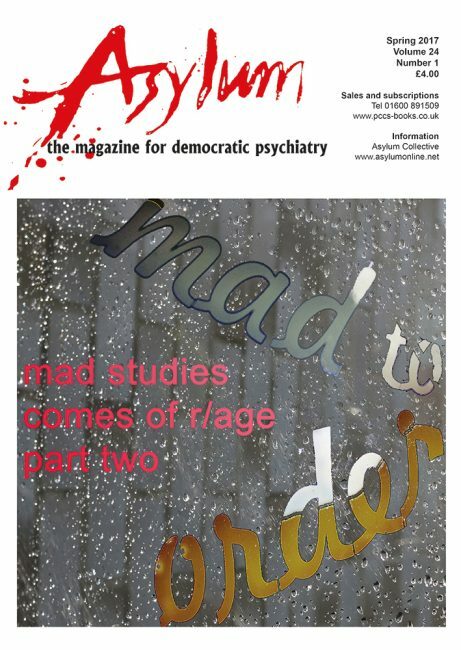 This issue is the second in our two-part series highlighting new and original work on the theme of Mad Studies – inspired by the second Mad Studies stream at the Lancaster Disability Studies conference in September 2016. It must be a sign of the times. Mad Studies comes of rage? This would have been music to the ears of Robert Dellar (1964–2016), friend and long-time supporter of Asylum magazine. Robert was a gentle, but provocative, advocate for Mad people, culture and politics. As we’re getting excited about Mad Studies, let’s not forget it couldn’t have happened without people like him. Robert was a key activist in organisations like Mad Pride, the Mental Health Resistance Network, and Recovery in the Bin. He wrote the brilliant book Splitting in Two: Mad Pride and punk rock rebellion (Unkant, 2014); co-edited Mad Pride: A celebration of mad culture (Spare Change Books, 2000); created numerous Mad Punk cds and gigs; and helped produce the excellent Southwark Network Mental Health News. Those of us who knew him will remember his kindness, humanity and generosity. We also mourn the loss of Mark Fisher (aka K Punk) who committed suicide earlier this year. In his life Mark had incisively dissected modern society’s destructive effects on our mental health, notably in his critically acclaimed Capitalist Realism: Is there no alternative? (Zero Books, 2009). We dedicate this issue to Robert, Mark and other kindred spirits lost to us. We still believe there is an alternative, and we still hold hope in these dark times. Let’s hope Mad Studies builds bridges, not walls.